Lighthouse deck manufactured, now it just needs software! We are glad to announce that we have manufactured the fist batch of Lightouse positioning decks and hopefully it will be ready to ship by the end of the month! The Lighthouse positioning deck is a Crazyflie 2 deck capable of receiving IR signals from HTC Vive tracking base station (ie. Lighthouses). The basestations works by spinning IR laser beams that are received by the deck to measure the angle at which the base station sees the receiver. 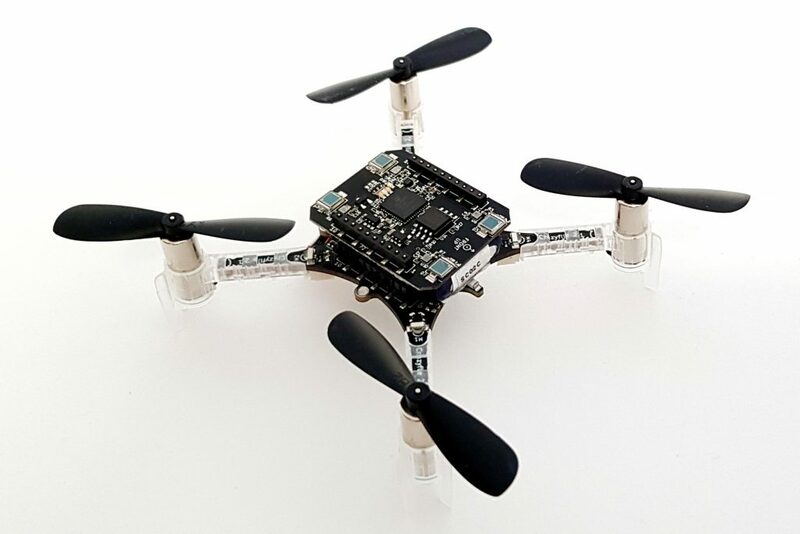 This allows the Crazyflie to estimate its position with great accuracy and so to fly autonomously. The board we produced is very similar architecture-wise to the prototype we showed in previous blog posts. The main physical difference is that we now only have horizontal receivers. This change was made because we do not yet have a satisfactory mechanical solution to mount vertical IR receivers and we arbitrated that horizontal-only sensor already provides great performance for autonomous flight. Functionally it means that the Crazyflie should fly bellow the base stations to be able to position itself, we found that flying ~40cm bellow the base station gave good flying performance. We will continue looking at solution to make a deck with more receiver to increase the flight space in the future. HTC has released 2 versions of the base stations that are incompatible with each other. Version 1 supports 2 base stations per system, and version 2 can support more than 2. We have good initial support for version 1 both in the deck and in the Crazyflie. Version 2 is currently being worked-on but early work shows that the deck should be compatible with version 2 with only a firmware update. This leads to the current state of the product. The boards have been manufactured and we have received them but they are currently programmed with a test firmware. As previously stated the basic functionality is there but we still don’t have any finished bootloader. As soon as this is finished and tested we will start flashing all the boards. After that is is just a matter of adding them to the web-store stock and they will be ready to ship! For now we consider this deck as early access, which means that we will document it in the wiki and that the software will still be heavily developed. For example an early limitation that will be worked-on is that it is currently required to run SteamVR on a computer to setup the system, this means that you need to have a full Vive VR setup or at least a vive gamepad or tracker to setup your flight space. Eventually we want to make it possible to setup the system with only base stations and a Crazyflie, without using steamVR. The positioning code is already part of the Crazyflie master branch. For the FPGA, the code is still in flux and we will push the repos on Github when we ship the boards.